One-word summary of this outing: Wet. Sweat on the way up, rain on the way down. I finished soaked from the top of my cap to the soles of my shiny new New Balance trail runners. Yes, I took rain gear; no, it did not keep me dry. 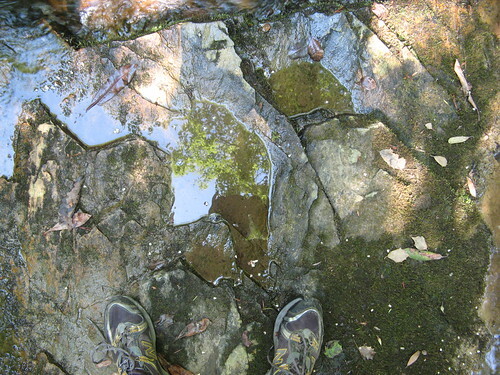 Backstory on this one: Hanging Rock State Park is the best place to hike within 30 miles of my front door. 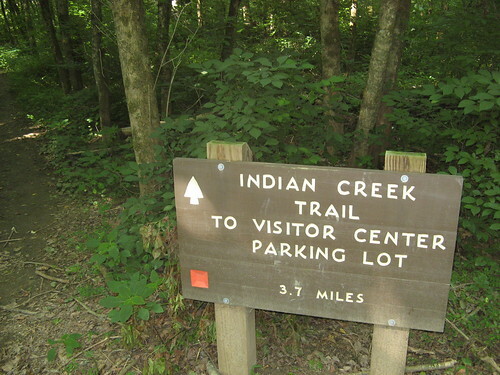 I’d hiked almost all the trails except a stretch of Indian Creek Trail up to the Dan River in the far northern section of the park, where the Piedmont Hiking and Outing Club hiked a few weeks back. I got up Saturday morning in no mood for a long drive to the Blue Ridge, so I decided to follow in their footsteps, adding a quick jaunt up to Hanging Rock. 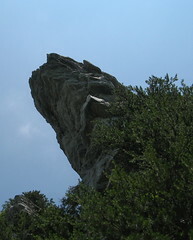 Hanging Rock has glorious views of the nearby terrain. The most sensible way to get there is to park at the visitor’s center and take the one-mile trail to the rock. It’s steep and rocky in the last quarter-mile; doable but not crazy-difficult. Getting there from Dan River via the Indian Creek Trail is another matter: five miles one way with nearly 1,400 feet of ascent, complicated by suffocating heat on the way up, the risk of a lightning strike at the top, and the likelihood of hiking back in a thunderstorm. The hiking club had the right idea: Take Indian Creek Trail up to Window Falls and Hidden Falls, pause for lunch at the park lake and go back the way they came. I arrived sweat-drenched and foot-sore at the end of Indian Creek Trail, but it was only another mile to the vistas of Hanging Rock. How could I not go? 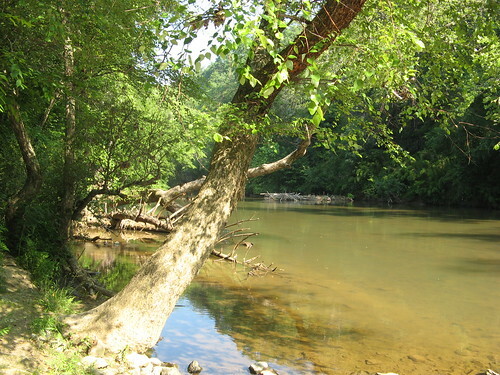 Here’s the Dan River, practically begging you to launch a canoe full of beer. How to find the trail: if you stand in the parking area with the river to your right, the trail will start at the edge of the timber over to your left. Only notable wildflowers I saw on the entire hike. All the rhododendrons bloomed a few weeks back, apparently. First thing you learn on the Indian Creek Trail: It’s very hard to keep your feet dry on the first couple crossings within the first half mile. This is fine on the way in: it helps keep your feet cool; bad news is you’ll probably come back to the car with wet feet. 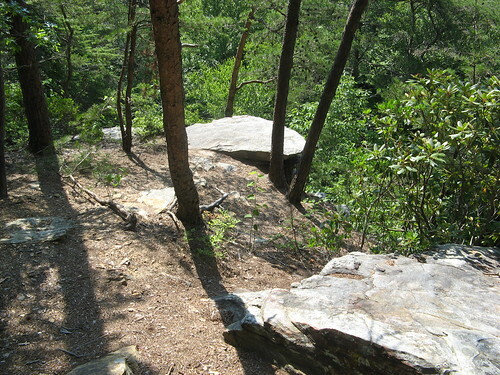 After about a mile the trail opens to a broad overlook of the nearby terrain. Watch your step, those are real cliffs over there. Hiking is very pleasant: shady, with a mild upgrade. The trail tracks a ridge up above the creek, then returns to creek level after about another mile. 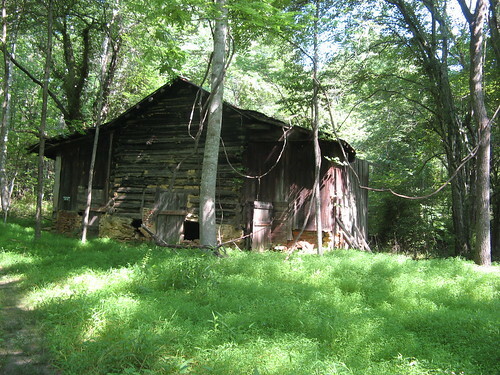 A tobacco barn about two miles up the trail. Not far from here, you cross the paved road going into the park and pick up the trail on the other side (look for the orange “cable warning” post over to your right). The trail gets steeper and prettier on the other side of the road. Occasionally a bend in the trail will enter a very shady section where a breeze blowing over the water feels like somebody turned on the air conditioning. The steepest parts of the trail are near the waterfalls. 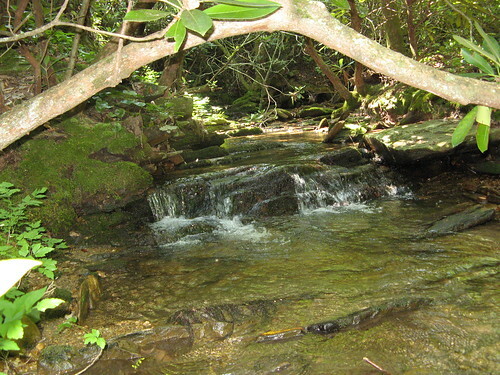 (Last seen in my post describing Hanging Rock’s waterfalls). 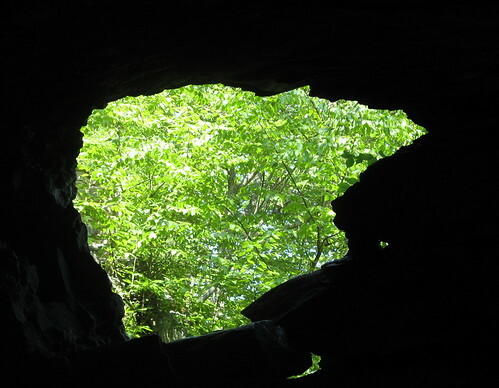 This is the stone window at Window Falls. Lots of fun scrambling here, just keep in mind your shoes will lose most of their traction if you get them wet. Note when you get back on the trail after visiting the waterfalls: You’re coming up a steep hillside with very little breeze. Typically this a very manageable climb, but after almost four miles of high humidity and 90-degree temperatures, I was nearly tapped out. After the waterfalls I paused for lunch in one of the large shelters along the trail, not far from the visitors center (fortunately nobody was using it at the time). This shelter has a water faucet and fountain, great places to refill water bottles. From here it’s a short jaunt to the visitors center parking lot; Hanging Rock Trail is just down to the left. It starts out downhill, oddly enough, but soon starts climbing. Steepest part starts when you hit a series of wood stairs. 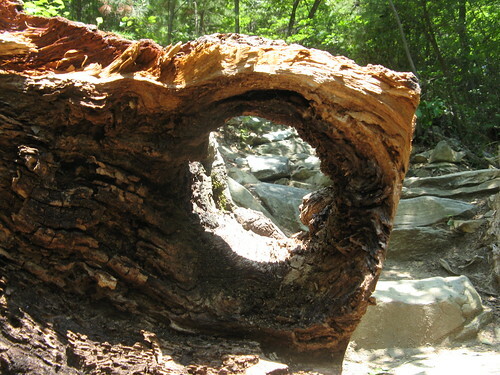 Couldn’t resist shooting this hole in a fallen tree limb. At the top, finally. Views were awesome. Those clouds were so pretty before they turned into a thunderstorm. The rock up here is most excellent. Within minutes of turning back, I noticed the wind pick up speed. 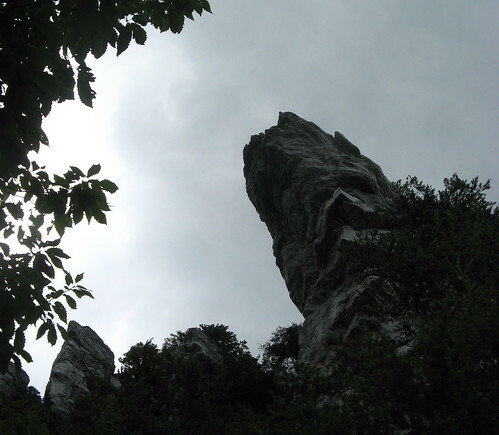 By the time I passed under Hanging Rock on the way down, skies were already getting stormy. I dashed back down Hanging Rock Trail as fast as I could manage. I must’ve passed a dozen people marching upward into the storm, oblivious to the First Commandment of Avoiding a Lightning Strike: Avoid high, exposed rock. I turned back onto Indian Creek Trail just as it started sprinkling. I stopped at the shelter where I lunched earlier, refilled my hydration bladder and headed downhill. It rained for most of the last 3.5 miles of the hike. I put on my trusty rain poncho and immediately realized its limitations — it felt like a sauna under there. Still, there is something magical about a forest in the rain. If the trees had faces, they’d be smiling. It was pure hiking bliss till I got to the overgrown parts of the trail, where wet vegetation drenched me from the knees down. The rest was a soggy slog back to the car. Would I do this hike again? 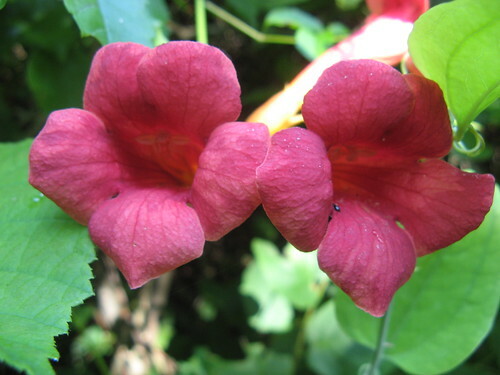 Probably, but not in summer if I can help it. Better attempted in the fall with the colors, or late winter before the trees fill in again. If I’m feeling frisky, I might try to do it as an epic peak-bag: add the Wolf Rock and Moore’s Knob trails for a 16-miler that covers all the park’s high points. “There is something magical about a forest in the rain. If the trees had faces, they’d be smiling.” I’m with you on that one, Tom. Looks like a sweet hike. Makes me miss the Appalachians. Another great hike and post, Tom! I think no matter where you live in this great nation – unless it’s central Iowa, maybe – you’re gonna find amazing and scenic beauty! You might even find it in central Iowa if you look hard enough. 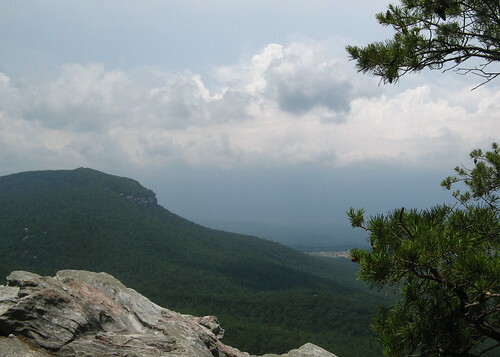 I have hiked every bit of Hanging Rock and Pilot Mtn. I love the closesness of these spots to the Traid. In fact, when I finished all of the trails inside the parks I hiked the Saratown Trail that Connects them. Its a 22.2 mile hike, and its a bridal trail but it was part of the MST and it was there to be done. I know a great spot to stay if you plan to make it a two day thing. Lance; i stopped by your site … loved the steelhead fishing! Love to hear your suggestions for other places to hike nearby. I’ve done all but a mile or two of Hanging Rock and all of Pilot Mountain. Those are some beautiful, color-perfect pictures from the summit. 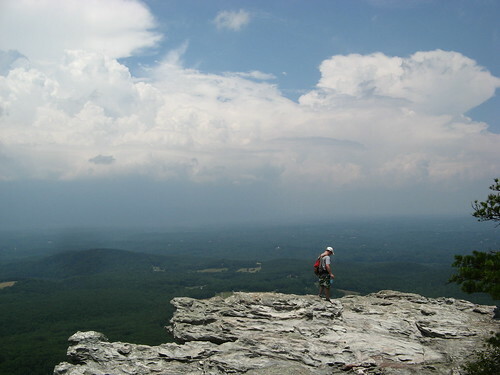 I just commented on one of your posts about Pilot Mtn, and now I want to try Hanging Rock. 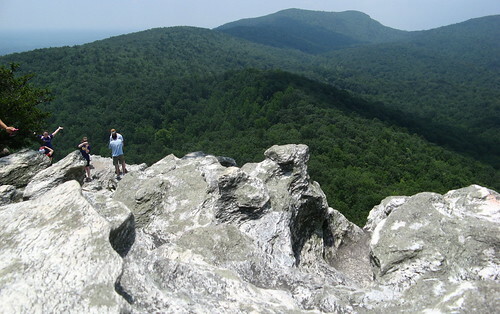 Hanging Rock is one of NC’s best places to hike east of the Blue Ridge. Great trails, scenery and waterfalls.